Tackling the climate crisis needs workers to build a world fit for the future. Yet the narrative of 'jobs versus environment' is still heard across the political spectrum, derailing the action we urgently need. 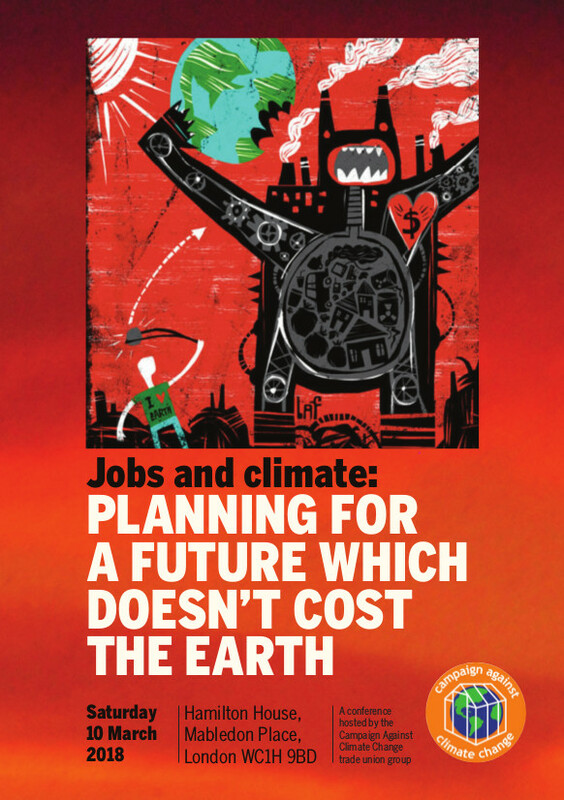 This conference, organised by the Campaign against Climate Change Trade Union Group, aims to challenge the false choice of good jobs versus the environment. Instead of settling for this, there is both an urgent need for action on climate change and a real opportunity for trade unionists to be at the forefront of campaigning for a transition. One which puts the needs of the planet, decent jobs and social justice at the top of the political agenda. The conference, for trade unionists and others interested in the issues, will be an opportunity to hear from trade unionists, scientists, environmental activists and others about the issues; and to learn from grassroots action today as well as debating a vision for the future. Food and Agriculture - is a sustainable food system possible?